74% teens say they access the internet on cell phones, tablets, and other mobile devices, at least occasionally. Devices running Chrome, Android, or iOS now all have full access to web-based features and content saved online. On average, households in North America have seven active connected devices. Nine in ten households whose income is below the national median for families with children have some access to the Internet, although usually through the data plan of a smartphone shared among the family. Managing to all of these variations is overwhelming. Give learners access to content and literacy supports from whatever device they have available at the moment. Ensuring that supports all look and act the same way, regardless of device, further lowers learning barriers outside of the classroom—which is especially important for students who are already struggling. How can you address the needs of all students on all devices? We’ll break it down for you. Plays a big role, too. Chances are if Chromebooks are part of your daily classroom, Google for Education plays a big role too. Open files directly from Google Docs into the Kurzweil 3000 web app, or read content created in Google Docs with the Read the Web Chrome Extension. Just add the Kurzweil 3000 Google Chrome App and accessible content is one-click away. Reading, studying, researching—even writing and completing assignments and tests can all be accomplished on the iPad. Content saved online are all accessible with the Kurzweil 3000 iPad app—which is free with a subscription. Features for reading and reading comprehension—including notes and multi-color highlighters—allow learners to access content beyond their reading proficiency level. Turning digital and print text into accessible content is a breeze. Simply take a picture of the content and upload it directly to the Kurzweil 3000 online library. 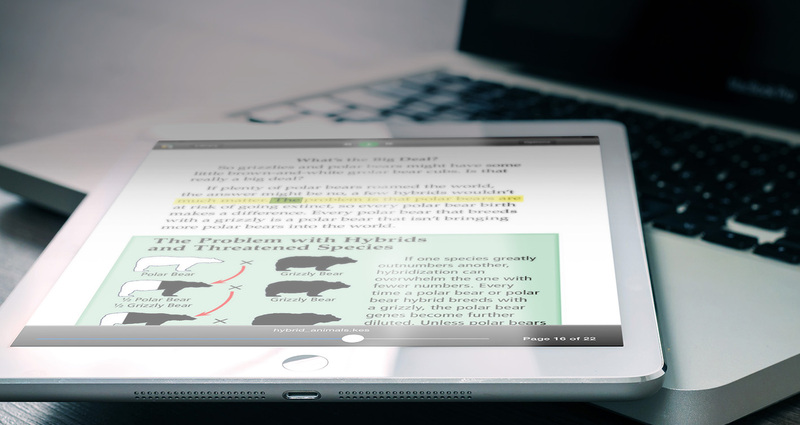 Assignments and tests can be administered on the iPad, with test-taking accommodations ranging from text-to-speech and translation from text-to-speech and translation, to highlighting. Students who have an iPad and need writing support can access brainstorm, word prediction, and spell check through the Web App. Learners can highlight in the iPad app, then continue working in the web app—exporting highlights to an outline and then begin writing. For the most comprehensive literacy support, install Kurzweil 3000 directly to your desktop or laptop. Projects and assignments where only common supports are needed can be supported with the Kurzweil 3000 Web App. Take a video tour of the Kurzweil 3000 for the browser, or dive into comprehensive features below (including the new offline mode). With over 20 years of development, the computer application of Kurzweil 3000 is highly versatile. Both the Mac and Windows version have a variety of tools that can assist learning in many ways. If you have a specific need, Contact Us. We can show you exactly which features will work best. You don’t need to be an expert of using every tool in k3000 for it to be effective. We’ll show you how you can address the needs of many students with just a few features. For individual users, k3000 for Mac and Win can be purchased outside of a Web Access subscription as a Standalone. Using k3000 as a standalone, or network, is a good option for schools and districts who live in remote areas with low or no internet connectivity. Schools where centralized content and user management and reporting across devices is important will want to inquire about k3000 Web Access.